Thank you to everyone who drops by here. Thanks for your friendship, support and encouragement. It means so much to me. I hope you all have wonderful holidays. I didn't have time to do a blog post but I did put some photos of my tourtières and some cookies Emma baked on my Facebook page. It's hard to keep up with my blog, Facebook and Twitter at the best of times and nearly impossible during the holidays. By the way, we ate some of the tourtières last night (Christmas Eve) and they were delicious. Yesterday, despite a million other things I should have been doing, I sat down to paint a little and was so glad I did. I did get up there in time. I did remember. Chloé was the one who suggested that I leave one pomegranate whole and cut one in half. I love the juxtaposition of the outside peel and the wonderful seedy inside of the fruit. I painted it on a beautiful pad of Sennelier rough grain paper that Lucile gave me this past summer. I was thinking about Lucile when I painted the pomegranates and I tried to leave my painting a little looser than I normally do--inspired by her endlessly beautiful and fluid watercolour paintings. Meeko and I are so happy to have our forest path back. 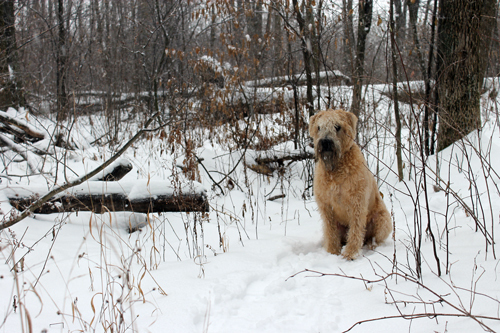 We can only walk there during the winter as it is too swampy the rest of the year. We are so lucky that it is at the end of our street--a tiny slice of natural paradise in the middle of a suburban development. It is the only place that I will let him go off-leash. He knows the routine. He knows the path. It provides a wonderful combination of freedom and peace for both of us. 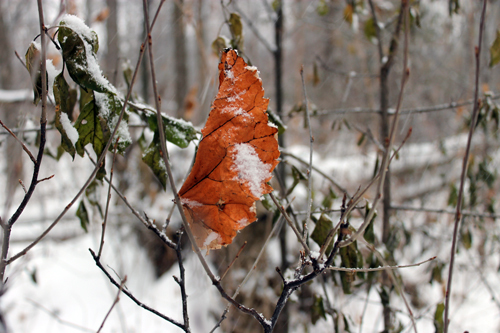 On one of our walks this week, Meeko and I walked past one of the last bits of autumn colour outside--a lovely leaf hanging on despite the wintry weather around it. Making our Christmas tourtières is one of the next things on my list. Still a number of things to check off my in order to be ready for the days ahead. Good luck with your lists! 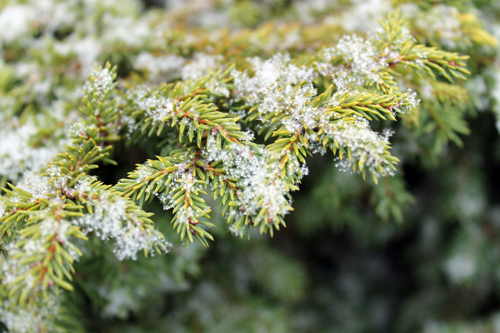 Yesterday, despite the very cold weather, we ventured on our annual Christmas tree cutting expedition. This is a family tradition that extends to my own childhood. 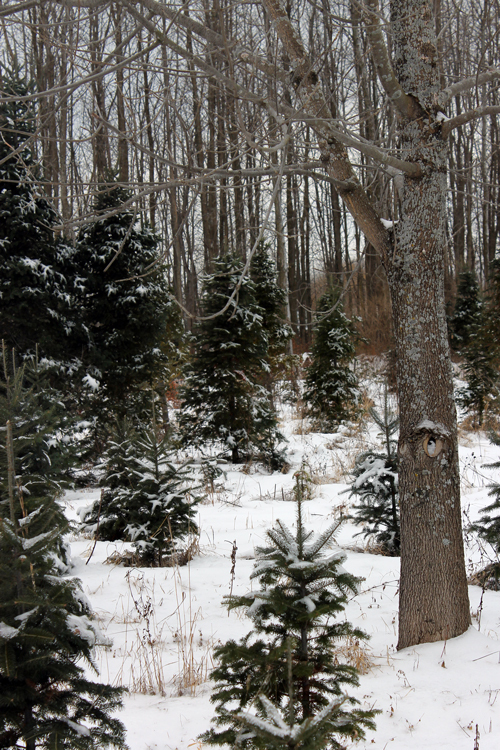 The tree farm we have gone to for the past three years is about an hour's drive from home. This farm actually sell cut trees at a location very near to our house but somehow going to a lot isn't the same as choosing your own tree in the middle of a snow-covered field. Meeko is always very excited to go anywhere in the car even if he doesn't know where he is going to end up. A tree farm is much better than the vet! This is Emma and Chloé standing in front of our chosen tree just before it was cut. It was so cold that they actually went back to the car and let Mama and Papa Lumberjack cut it down. There are many goofy photos of the junior lumberjacks that I would have loved to have included but unfortunately I was not given permission. Even Meeko is getting excited about Christmas. Actually, I'm not sure he was all that joyful about having reindeer antlers on his head but he was a very good sport about it. 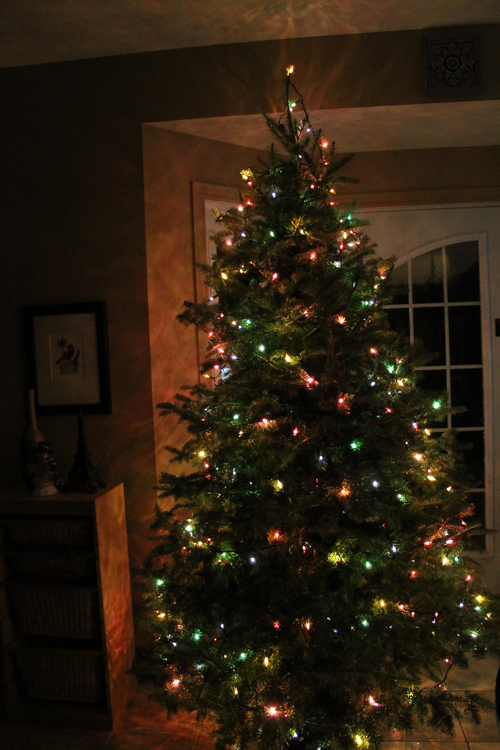 There was a lovely snowfall last night as we were decorating our tree. It's amazing how a little snow makes everything feel more Christmassy. For those of you living in places where snowflakes are rare or non-existant, I'll try to share more snowy photos in the days ahead. Good luck with all of your holiday preparations. 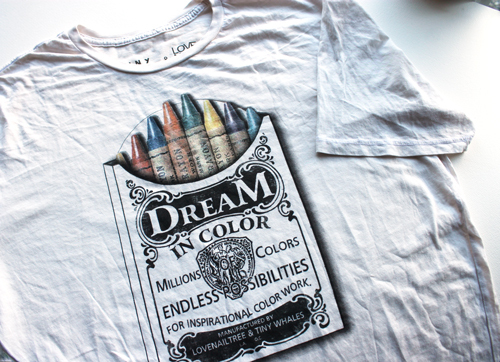 Do you dream in color? I'm not sure if I do. Meeko might though. He woofs in his sleep which makes me think that he must have very nice dreams. I just bought this t-shirt for myself. I saw it on a woman at the MOMA in New York in July. I went up to her and asked where she got it! Maybe it will inspire me if I wear it when I'm painting. Hope so. I bought it here. And speaking of dreaming in color, last night I ordered my iMac. Do you ever have moments when your fingers hovers over the 'enter' key. Should I? Should I not? I took a deep, deep breath and did it! It is my Christmas present from my husband (and then some). I wonder if I should wrap it up and look surprised when I open it on Christmas day? I have a feeling that I won't be able to resist using it before that. It's expected sometime next week. I can't wait. Do you have something that makes your heart go 'weeeeeeeeeeeeeeeeeeeeeee', as if you were a young child flying through the air on a swing? That's the feeling I got as I opened this package full of paper. I finally had a quiet moment to sit and open my order that arrived well over a week ago. It was full of beautiful handmade Twinrocker watercolour paper. Both Geninne and Diana had mentioned how much they liked it. I placed a small order a few months ago to give it a try and loved working with it. 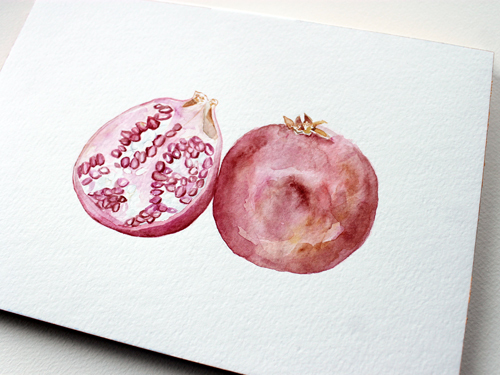 I did my painting of the French radish from my garden on it earlier this summer. 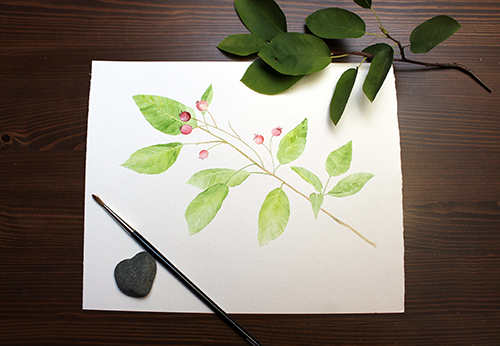 I also did the painting of the serviceberry branch that was in my last post on Twinrocker paper. 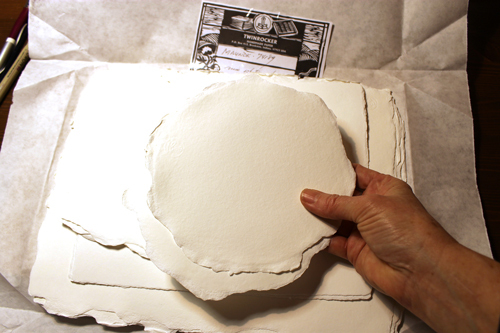 This time, I ordered some round paper (oh, the delicious possibilities) and three different rectangular sizes. I love the feathered edges. 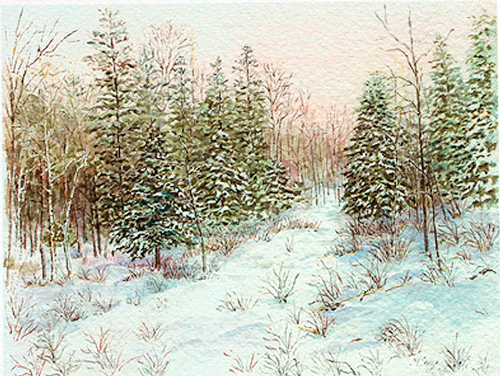 If you have an artist on your Christmas gift list, beautiful paper is certainly a lovely idea. You can check out the inventory offered by Twinrocker here. Pssssst! 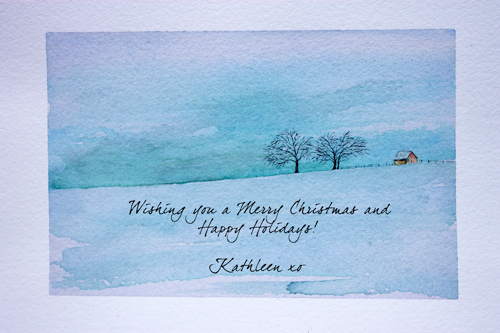 All of my holiday cards are currently 25% off in my Etsy shop. We are in the midst of a very tiny first snowfall. Just a dusting. Hardly enough if I'm reading the expression on Meeko's face correctly. But he still celebrated with his signature wild dash from end of the yard to the other, looping perilously close to stone walls, trees and other hard objects. We call it 'the weasel run'. It always ends with a spectacular leap up the stairs, taking several steps in one stride. Funny boy, with a sense of style. I'm not doing too well keeping up here lately. 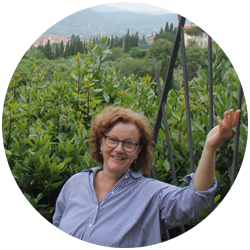 I'm not always replying quickly as quickly as I would like and I'm not getting to other blogs. I'm really sorry about that. There are lots of demands on my time recently. Chloé had two days of school holidays last week. And then, Meeko was at the vet for an overnight visit for allergy tests. What doesn't show in the photo above is a huge rectangular patch of fur missing on his left side where they shaved him for the test. Oh, it's hard to look at, even though I know it will grow back in. They did find that he has several outdoor allergies which explains the problems he's been having with his eyes, sneezing and paws. I had to take Emma to the doctor this morning. She is very rarely sick but has a sinus infection and a very bad cough that has had her professors sending her out of class during the past week. All of our computers seem to be ailing as well lately. I had major problems with the installation of new virus protection software I purchased. I worked on it for two hours on my own trying to solve the problem. Then the expert from the company took over a half hour to fix it. That made me feel better--that he didn't correct it in two minutes. I have to say it was pretty cool that he was able to help me through chat and long-distance control of my computer. But what a time-waster the whole problem was. That happened on an afternoon when I had full intentions of painting. Then Emma's laptop started acting up a few days later and, once again, I was the V.P. of technical services called to look after the job. Don't you hate when your time gets eaten up by stuff like that? And to top it off, last week I managed to kill my 4-year old laptop with a spilled glass of wine. I guess you could say I killed it with kindness. So it means that I have less access to a computer right now. Once the girls are home, the desktop is no longer mine. I have to make sure I do all of my Etsy, blog and Photoshop work during the day. I haven't been posting as much on Facebook or Twitter either. Maybe that's not a bad thing. One thing for sure, it's not the best timing for a big purchase before Christmas. It may be that the new computer becomes my Christmas gift. I have a wild dream of an iMac. We'll see, she said to herself, with irrational Christmas stars twinkling in her eyes. 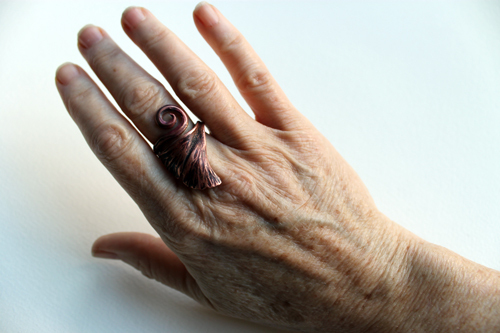 Just a little reminder that it's not too late to get free shipping on purchases in my Etsy shop. I am running the special until the end of the day Friday. Use the coupon code HOLIDAY at checkout. Just to let all of my lovely blog readers know that I'm having a free shipping special in my Etsy shop right through the weekend and until the end of the week. It's for Black Friday, Cyber Monday and just plain old Christmas shopping wherever you live! Just use the coupon HOLIDAY when you check out. I order a lot things online and I know there have been many occasions when I put something in my cart, see the shipping charges and change my mind. Even though I try to keep my shipping charges as low as possible, I thought free shipping would be helpful to everyone's budget. I've just added a new print to my shop. 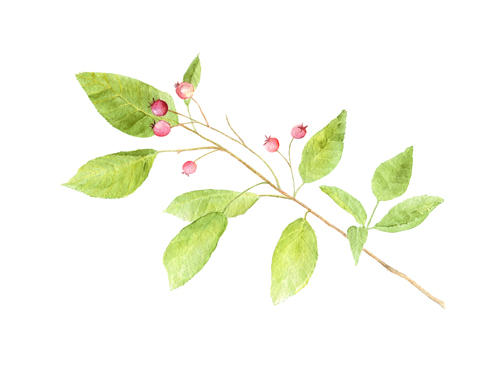 It's the serviceberry branch shown above. The original painting is shown below. Happy holidays to those celebrating in the U.S. and happy weekend to the rest of you! 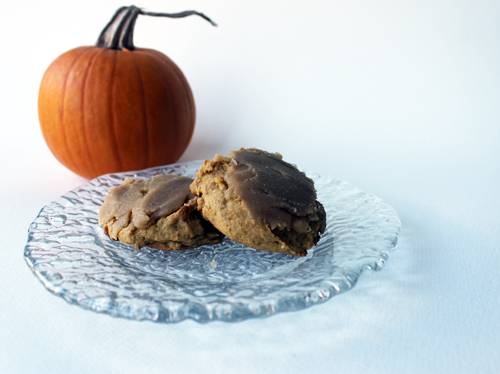 Chloé made the most wonderful pumpkin cookies yesterday. The house smelled so lovely and they tasted divine! Emma told her they were the best thing she's ever eaten. High praise from a big sister. Chloé followed the recipe here. I ate some. Well, we all did. Emma is right. They are very, very good. I also painted a couple. Not the same two above. Chocolate chips found their way into these ones. That happens here. In Canada, we celebrate Thanksgiving in October. I have so many blog and Etsy friends in the U.S. now that I feel like we should celebrate twice. I suppose being thankful twice a year (at least!) would not be a bad thing. Have a wonderful celebration! I've been happily painting the past few days. I was asked to create a painting as a special Christmas gift for someone. I have used five different reference photos to create my composition! What you see here is my first day's work on it. It has changed since. I've added some poppy seed heads and a few more flowers. There is lots still to do on it, adding layers of colour and detail. These photos will really give you a sense of how I start with very light washes. The lavender sweetpeas look like floral phantoms at this point but they will slowly acquire dimension and texture. 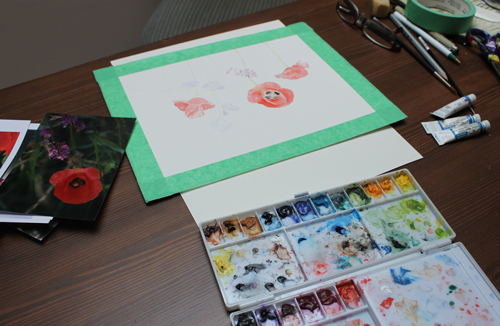 I will also deepen the poppies' colour and add texture to their petals. The hardest part of this painting was before I'd even picked up my paintbrush. I spent a couple of hours sifting through photos (some provided by my client, some of my own) and did a lot of thinking before coming up with a composition that would work artistically and also be of emotional significance for the recipient. I'm always a bit nervous doing paintings for others. It's important that I create something that pleases me but, most of all, them. I'm happy to say that I've already received a lovely note from my client about my progress so far. It's not the first time I've painted poppies. I posted a long time ago about a painting I did on my honeymoon of a poppy field in France. I even included a photo of a younger me sitting in the middle of a field while I painted. It's also not the first time I've painted a row of flowers. You just need to look at my blog header to see that. :) And there was the painting of wildflowers that I finished last year. It is available in my Etsy shop as a print. A row of tangled flowers is probably one of my favourite kinds of paintings to paint. Well, how did that happen? I always seem to react to the shift from warm to cold weather the same way--shock and disbelief. Wasn't I just topping the soil with compost, measuring out my squares and planting seeds here and there? It goes so fast. I was lucky that Monday was an unseasonably warm day. It allowed me to do my cleanup without my hands getting frozen. I was also lucky it hadn't snowed yet as you just never know here in November. The only bits left there are a big clump of Italian parsley, some lavender and thyme. What a glorious vegetable patch it was this year though. All of the heat and sunshine gave us more and bigger tomatoes than we have ever had. Everything was a little larger than our past crops by the end of season--beets, turnips, carrots. My only regrets? That we didn't realize the cucumbers were there until it was too late. The vines had snaked up through the shrub behind the bed and by the time the cucumbers were visible, they were beyond eating. Also, I meant to resow mâche seeds in August so we could have fresh autumn salads from the garden. Maybe next year. I don't do a full cleanup in the rest of the garden. I empty fragile flower pots that won't winter well, trim long rose stems that will get whipped around by cold winds and remove certain things from the flower beds like peony stems and leaves. 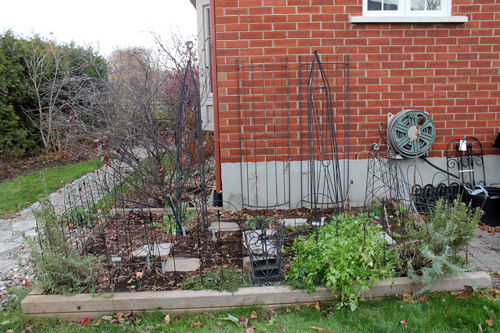 But, all in all, I leave a lot of the brown and wilted perennials until the spring so that the birds can perch on stems and snack on seed heads through the winter. As for me? Now I start to dream of my spring garden. 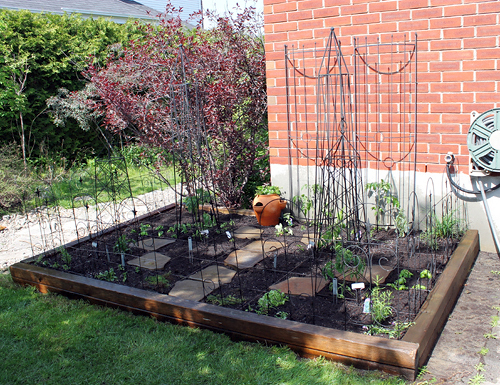 The square-foot garden just after it was planted in May. It has become much colder the past few days. My nasturtiums that edge the vegetable bed have completely wilted, a sure sign that the growing season is behind us. I brought in the last few vegetables that were in the square-foot garden. There's something very wonderful about pulling up relatively nondescript leaves and finding jewel-coloured vegetables at their base. 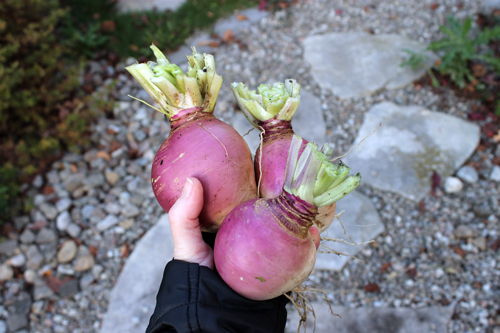 Above are the beautiful purple-topped turnips which have a more of a rosy hue at this point in the season. Below are carrots and beets. We ate the beets in a lovely risotto. Usually when I have beets in the house I make the late novelist and cooking writer Laurie Colwin's Beets with Pasta (from More Home Cooking) but the past two times I've made risotto. It is so pretty how the beets tint the rice. I added the beet greens too so the contrasting colours were lovely together. Below are some of the most beautiful leaves and stems of my vegetable garden: the rainbow swiss chard. So pretty and so delicious! We often eat them in pasta or just steamed with a little garlic and olive oil. Harvest always seems like a celebration tinged with a sense of mourning. It's exciting to be able to see and eat the vegetables you planted in the spring but sad to think that there are months before the whole process can start again. More views of my studio. 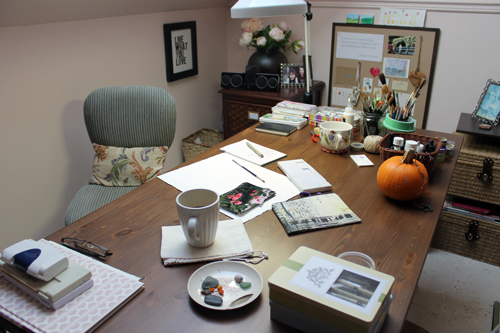 First: my work table which is pretty darn neat at the moment. There will always be a bit of clutter. I think that is part of the creative process--at least, mine. That sweet little pumpkin has been waiting very patiently for its portrait. (I'm getting to it.) What else do we see there? Several paint palettes. Some tea boxes I've converted to hold my Micron pens and cutting tools. Some reference photos for a painting I'm about to start. Several jars filled with pencils and paint brushes. Behind my chair, you can see the lovely letterpress poster 'Live what you love' that I bought from Heartfish Press when I was in the initial stages of getting back to painting (well before I started my blog). The bulletin board is really placed just for my eyes as I'm working, so it was a bit of a challenge to take a photo head-on. The single most important item for me on that board is the Van Gogh quote: "If you hear a voice within you say 'you cannot paint', then by all means paint, and that voice will be silenced." I often think about how sad it was that a man full of inspired words of encouragement for others was such a tortured soul himself. That quote has helped me over and over again. A more elegant version of 'Just do it'. The young woman on the bridge at Giverny is me on my honeymoon. And the beautiful wooden heart that says 'Bonheur' was bought in Paris years ago. The tiny acrylic landscapes on canvas (sitting on the top edge) were done by me and Chloé a couple of years ago. I had to replace a light bulb in the ceiling light today, so took advantage of being on a stepladder to take a spider's eye view of my table. I don't have side windows but have a nice skylight that provides decent northern light in the early part of the day. I still tend to use my art light (which has two bulbs that mimic daylight) most of the time. I sometimes miss having a window on the side walls but I would probably spend too much time gazing out of it. There is just one more view to show you of my studio. That's the front view from my table. I just have a bit more clean up to do there. Did you wonder if maybe I was just shifting boxes from place to place, taking photos and pretending that I had cleaned things up? Hah! Don't think I didn't think about it. No, I'm really happy that things are more organized now. I'll take that front view photo in the next few days. I have spent the past week cleaning my studio. I still have a few hours of work to do but there are parts I can show you now that you've never seen before. My studio is in the loft of our house. When we had our house built thirteen years ago, it was important to me that there be a space dedicated to my painting. In other houses and apartments I've lived in, I created painting spaces in nooks and crannies but this time I wanted a defined studio space. At the time we moved in though, Chloé was a newborn and Emma was four. I underestimated the time and energy that motherhood would require. Although I ventured upstairs to paint from time to time, there were long periods when my art light gathered cobwebs and my confidence as an artist waned from neglect. I definitely felt guilty that this beautiful space in our house was not being used properly but I knew that the day would come when it would. The past two years as I've returned to painting on a full-time basis, I was so intent on devoting my energy to creating that I let the clutter sit and multiply around me. I am most definitely a perfectionist. I prefer order but, somehow, I am able to ignore clutter when I want to do other things. Housework doesn't rank very high of my list of loves. But does it ever feel good to be restoring order to my studio space now! This is a sitting space in the corner of my studio. I dreamt of sneaking up here at night and reading novels when the girls were tucked in. But that rarely happened. Meeko tested out the sofa this morning. Two weeks ago, you could barely see the sofa let alone sit on it. There were boxes of frames and mats in front of it and it was covered with piles of artwork and paper. This is my storage cupboard. I made sure that it was built big enough to hold my 22" x 30" sheets of watercolour paper. I constructed the built-in shelves myself. The watercolour sheets are stored flat just underneath the triangular space at the top. I have enough sheets and pads of paper to last me a long while but still have trouble entering an art store and not buying some sort of new paper to try. This is my collection of art books as well as art and home decorating magazines. I've put a lot of magazines in the recycling bin in the past week and don't subscribe to as many anymore. I find it hard to keep up with them. I still am holding on to my Mary Engelbreit magazines, though, as they are not published anymore. I used to love the artist profiles they did. I'll show you some other perspectives of the space in the days ahead. I have a bit more cleaning and then I have a commissioned painting to start on. It is so cold this week! I saw snowflakes in the air when I was walking Meeko today. A cozy, warm studio space seems like the perfect place to be. What a strange night it was watching the storm from a distance through social media (Twitter mostly) as it descended upon the East Coast. Despite severe weather warnings here, we were very lucky. There were thousands in Quebec without power this morning but damage was minor. In our neighbourhood, everything was intact. 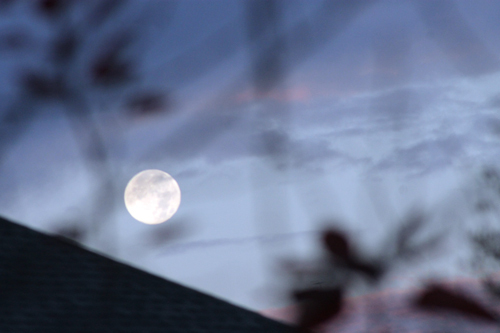 I found it odd that we were looking at a beautiful and serene Hunter's Moon while the weather was so ferocious elsewhere. I took this photo this morning. I would have taken more but Meeko somehow got it into his head that the tripod was attacking me and wouldn't stop barking at it. Or at least, I think that was what he was thinking. Then, he spent a good part of the morning staring out the window. I'm curious what he was thinking about then too (apart from squirrels and maybe the tripod). I know what I was thinking about last night and this morning. I was thinking how lucky we were not to have been affected by the storm. We were evacuated from our home for 10 days during the Ice Storm of 1998 and we felt the effects long after the storm had faded away. There were good things, as families spent more quiet time together because of not having electricity, and there were bad things, that even children who were in the womb at the time suffered long-term effects from the stress. Emma was three at the time and we stayed in three different homes over the course of 10 days. My heart goes out to those who have been affected and displaced by the storm. It will take a long time to recover from the physical and psychological effects of Sandy. And there's stuff that isn't important in the scale of things but I know that there are little kids sad to be missing school and maybe even trick-or-treating. I was also thinking about a chihuahua and her owner last night as I knew that little dog who was lost three weeks ago now in Brooklyn would be top of mind for Danielle during the storm. Little Myrtle is in my thoughts every day. And I thought about how odd it is and not really right, that we are hit harder sometimes when we know the place that is devastated in a natural disaster. I guess it's because it deals with the familiar. It's not that we don't care about the disasters that occur far, far way. I donate to international disaster relief when and if I can, as I'm sure you do too. It's just harder somehow when we know and identify with the landmarks, the geography and the people. Meeko perked up a little this afternoon and then resumed his contemplative mood. It was just that kind of day.